Trent Richardson came into the NFL with lofty expectations to help turn around a Cleveland Browns franchise that hasn't had much success in recent years. Things didn't work out. After a little more than a season in Cleveland, the running back was sent to the Indianapolis Colts. The hope was that he'd add another dimension to the Andrew Luck-led offense. While Richardson had a couple strong moments, his time in the NFL thus far has been very disappointing. 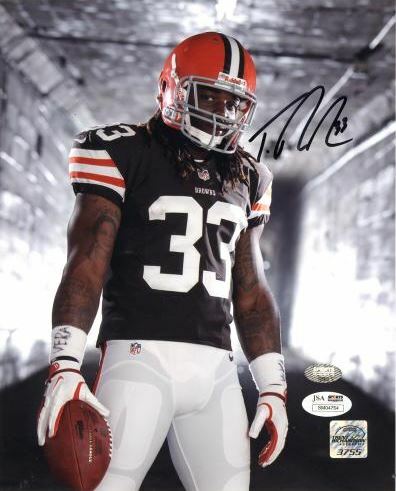 Is it time to abandon Trent Richardson cards? It's still early, but if his first two seasons are any indication, he could be a bust. However, there might be some opportunity yet. And with prices already down a significant amount, the risk is less than it once was. But it's still a major risk at this point. As a top recruit, Richardson turned down several high profile programs and made the decision to play for the University of Alabama and Coach Nick Saban. He spent three seasons with the team, helping Alabama win two BCS National Championships. Richardson was named a unanimous All-American and SEC Offensive Player of the Year in 2011. 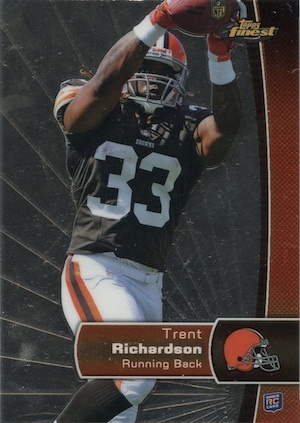 After his Junior season, Trent Richardson declared for the 2012 NFL Draft and was expected to be a first round selection. Trent Richardson did not have to wait long to hear his name called, as the Cleveland Browns took him with the third overall pick, after Andrew Luck and Robert Griffin III. Although he had a solid rookie season, fellow rookie running backs, Doug Martin and Alfred Morris, overshadowed him with better seasons. Early on in 2013 season, Richardson was largely unimpressive, but nothing suggested that a big change was about to happen. 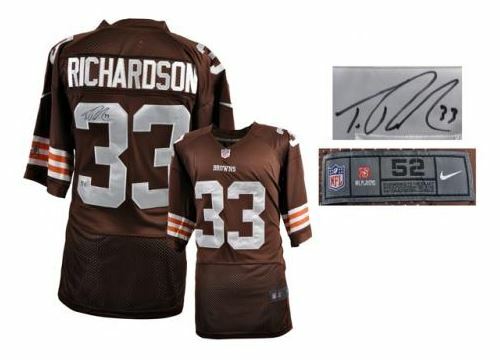 Trent Richardson's trade to Indianapolis came as a shock to many and left fans and collectors with a lot of questions. The fact is that Richardson joins a much better team with several offensive weapons, including start quarterback, Andrew Luck. Whatever reason the Browns had for trading Richardson will be irrelevant if he can produce in Indianapolis. 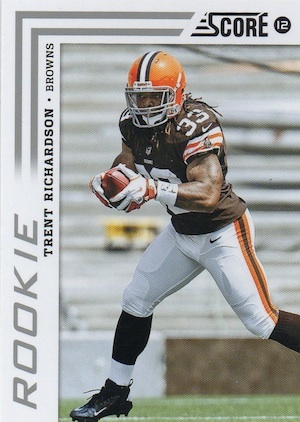 Collectors have nearly 40 rookie options to choose from when purchasing Trent Richardson cards. The large amount allows for a good mix of low-end and mid-end base cards, as well as high-end autographed cards. 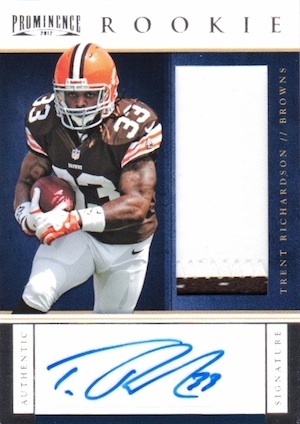 Although not generally considered among official rookie cards, Trent Richardson also has several first year cards found in college-themed 2012 Upper Deck football products. 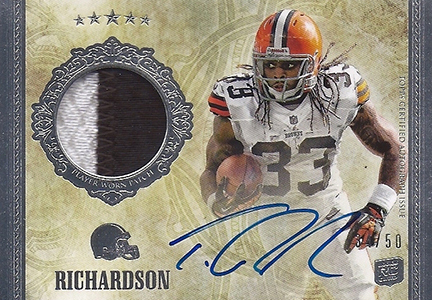 One of several autographed and memorabilia cards Richardson has within the Five Star set, card #180 is his official rookie card. The horizontal layout has a patch and on-card signature. It is limited to 50 serial-numbered copies. The National Treasures rookie card is limited to 99 copies, although parallels exist numbered to 49 and 1/1. A small player photo sits adjacent to a large multi-color jersey swatch and is complimented by an on-card signature. 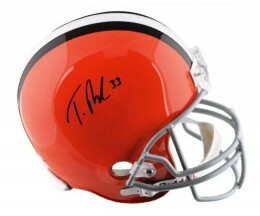 Below you will find an example of what Trent Richardson's authentic signature looks like. This can be used as a first point of reference for determining the legitimacy of autograph memorabilia, but is not a substitute for having your items authenticated by a well-respected professional autograph authentication company. Some of the trusted sources within the sports memorabilia market include the following companies: PSA, JSA, Tristar, and Mounted Memories. Click on any of the images below to view full size photos. The entire signature s written on an even horizontal plane. The letters "T" and "R" are the most distinguishable. The "T" has a short vertical line on a right leaning angle and a long crossing horizontal line on about a 35 degree angle that does not touch the vertical line. A "." implies the rest of the letters of the first name. The "R" is made with a single pen stroke that looks more like an unclosed and elongated oval. Coming off the "R" is a character that looks like an uncrossed "A" with a curved top. His jersey number "33" often accompanies the signature.